Starring: Robert Downey Jr., Val Kilmer, Michelle Monaghan, and more. Requested from my friend, Jon, around the time when ‘The Nice Guys’ came out in May earlier this year. ‘Kiss Kiss Bang Bang’, for those who do not know, is a buddy cop crime flick starring Robert Downey Jr. and Val Kilmer. A notable role for RDJ due to this film coming out in 2005, around the time he was on the rise from battling his drug addiction. On a different note, this review is being done after watching ‘The Nice Guys’ which was also done by writer and director Shane Black. A film I was not, overall, too wild about (See review of ‘The Nice Guys’ here). 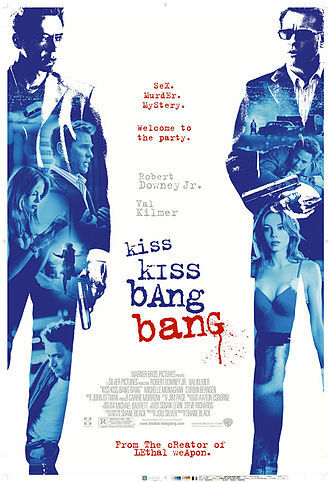 So here we are now to see how ‘Kiss Kiss Bang Bang’ does in general and also compared to my indifferent feeling to a similar Shane Black movie. The story of ‘Kiss Kiss Bang Bang’ follows a strange collection of three individuals. A private eye, Gay Perry (Val Kilmer), a struggling actress, Harmony (Michelle Monaghan), and a petty criminal pretending to be an actor, Harry Lockhart (Robert Downey Jr.). As the three have their lives strangely intertwined by a murder mystery, the three team up to solve a crime that becomes more complex with every passing moment. ‘Kiss Kiss Bang Bang’ was definitely a fun one to view. The team of RDJ, Val, and Michelle have a chemistry that works very well on screen and the story develops well as the run time continues, creating an ever changing engagement to the plot from the audiences’ perspective… Easily, Robert Downey Jr. is a fan favorite within the film. Viewing this movie for the first time while watching many other more recently released RDJ movies, it is clear to see how fantastic of an actor he is and how compelling he is as he demands attention with every word or action he projects. On the flip-side of things, he as the narrator made me laugh on multiple occasions… Comparing ‘The Nice Guys’ to ‘Kiss Kiss Bang Bang’, this film easily beats ‘The Nice Guys’ out in my book where I simply found this far more entertaining than it. A very comedic and compelling film for your viewing pleasure. Fun from start to finish yet very clever and intelligent as well.